I’m not often caught short of words but these $600 bottles of WATER have left me speechless. 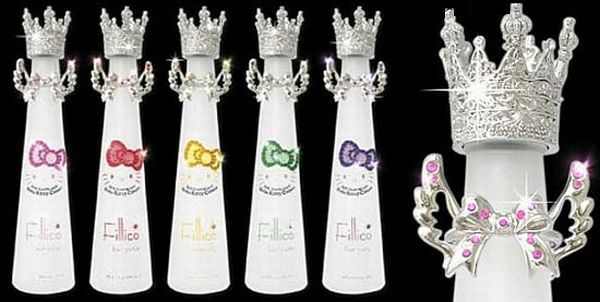 Hello Kitty must know her fans are devoted but are they committed enough to shell out for one or all of the five limited edition bottles of water by Fillico? The jewelled bottles mark the celebration of Hello Kitty’s 35th birthday and are available in different colours and with different messages – red is for friendship, pink for cute, yellow for sympathy, green for good wishes and lavender for ‘sweet’. Fillico filled the gap – each bottle features Swarovski crystals and water bottled from a natural spring in Kobe, Japan. Personally, I’m still coming to grips with the term ‘jewelry water’ – what?! A set of five bottles costs ¥52,500 (approximately $670) however Fillico does not ship to Australia.